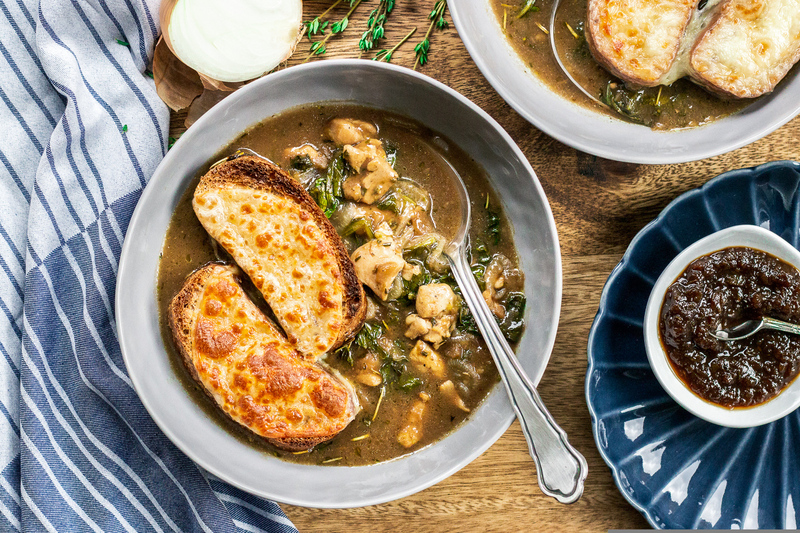 A twist on a classic, this stew boasts tender bites of chicken and ribbons of wilted spinach simmered in a delicious caramelized onion broth, thanks to the addition of SaltSpring Kitchen Co.’s Onion & Thyme Jam. Finished under the broiler with a lid of ciabatta toasts and broiled provolone. Preheat oven to 400°F. Slice each ciabatta bun into 4 slices. Lay onto sheet pan and place in oven immediately. Toast for about 8-10 minutes or until golden and lightly toasted. Remove from oven and set aside. Meanwhile, heat 1 tbsp. (2 tbsp. for 4 servings) each of olive oil and butter in a large ovenproof skillet over medium-high. Add onions and saute for 5 minutes. Wash, pick and chop thyme. Drain chicken and pat dry with paper towel, dice into 1 inch pieces and season with salt and pepper. Add to the skillet along with herb blend and fresh thyme and saute for 3-4 minutes. Add sherry cooking wine, balsamic vinegar, and onion and thyme jam. Mix well, scraping the bottom of the skillet with a wooden spoon. Add flour and 2 cups (4 cups for 4 servings) water, and stir until evenly mixed. Crumble in chicken stock cube. Bring to a gentle simmer and reduce heat to medium low. Cook for 5 minutes. Add spinach to skillet and stir until wilted. Place the buns on top, grouped closely together. Place provolone slices on top of the buns. Place in the oven and turn on the broiler to melt and crisp cheese. Watch carefully so it doesn’t burn! Scoop the stew into bowls, keeping the buns on top. Enjoy!